Today we are announcing new ways to drive greater discovery and engagement with games on Facebook, including games stories in News Feed and a games Timeline unit. We are also testing the addition of a prominent link to app requests on the homepage, a games-only activity feed and changes to the live ticker. After launching games stories in mobile feed, we are now bringing this feature to Facebook.com. 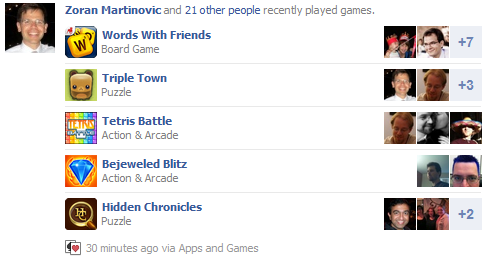 Gamers and non-gamers alike will see stories that list games their friends are playing the most. These stories are designed to bring new users and significant re-engagement to games by encouraging users to discover games their friends are playing. We will continue to refine the design of these stories based on performance. You can track referral traffic from these stories by referring to your app insights. Go to the Open Graph tab and look for the Action: Play in the drop down on the top. All users now have the option to have their games activity appear on timeline. We recently launched a new Timeline unit that deeply integrates a user's top game activity over a given period of time into their timeline. This unit highlights the games users play the most, as well as top scores and achievements, allowing for quick re-engagement for the user and discovery among friends. We are testing a new link to outstanding games and apps requests on the upper right corner of the home page. The new link will increase the visibility of outstanding requests and is designed to drive more traffic to games and apps. We are testing a new games-only feed with friends' game activity on the Apps and Games dashboard. The "Friend Activity" sub-menu sits directly beneath the "Apps and Games" bookmark in the left hand navigation and is accessible to users who visit the dashboard. As we work to optimize the canvas experience, we've found the live ticker alongside games and apps has not been a substantial driver of traffic. As a result, we are experimenting with removing the current version of the ticker on games and apps pages, and are exploring other ways to improve and simplify the games experience. We will continue to show the bookmarks on games and apps pages, which drive significant traffic and re-engagement. On February 1st, we will remove all App Profile Pages. If you haven't already, follow our instructions to migrate your Likes and vanity URL to an existing Facebook page. We continue to work on additional features to drive greater discovery and engagement with games and apps. Please provide your thoughts and feedback in the comment below.